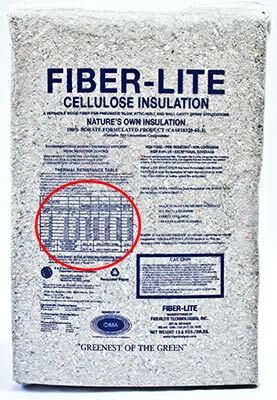 Cellulose insulation bags, like this one from a CIMA member, have installed thickness and settled thickness columns on the coverage chart. A home building company recently contacted CIMA. They were considering changing standard features to include cellulose insulation in an effort to offer greener, more energy-efficient homes. But they had heard cellulose insulation settles and wanted to know how this affected the product. Let’s settle this old myth that has been rebuffed by research and experience over many years and millions of successful home and building installations. Settling is a normal occurrence with any loose fiber material as the force of gravity works over time. This is true for all loose-fill insulation products. The phenomenon is easily accounted for and simple to overcome with cellulose insulation. Through research and testing, the amount of settle has been analyzed and recommendations verified for how deep cellulose insulation must be to compensate for settling. By federal law and industry standards, compensation for settlement is built into cellulose insulation coverage charts. Every manufacturer is required to include a chart on their packaging to list the depth required to achieve desired R-Values. Additionally, professional insulation installers must display a similar chart in the attic verifying the required depth of the insulation has been met. In walls, standard practice is to install cellulose insulation at 3.0 to 3.5 PCF. This process is often called “dense packing.” It prevents settling in wall cavities. Dense packing is also necessary to prevent loose-fill fiberglass from settling in walls. When installed properly in accordance with the coverage chart, cellulose insulation will not settle below the intended R-Value. So professional insulation contractors, builders, architects and consumers can rest assured that cellulose insulation will provide exceptional insulation in homes and buildings for years. And that settled it for the builder who is now differentiating their homes by offering The Greenest of the Green – Cellulose Insulation as their standard. Find more myth busting facts about cellulose insulation. This entry was posted in Cellulose Insulation, DIY & Insulation Tips, News & Information. Bookmark the permalink. Please give details on dense packed cellulose for exterior walls. Will it settle, even a little bit, over time? I am very comfortable with cellulose for the attic, and have in fact installed it or upgraded it in half a dozen homes for my family. But the walls… will there be a void at the top of the insulated stud wall cavity after 10 years? The insulation business in my city is, I believe, fraught with cheats and fools. I have yet to see the attic of a brand new home which had the promised amount of insulation blown in. Are those same bozos going to short me in my walls? An attic is easy to inspect (so it is amazing that so few people do it) but a closed wall is not so easy. Any advice you have to offer will be welcome. Thanks.